I had the smart idea of serving hot spicy soup this week on a 30 C afternoon. But! I have heard that eating soup can actually cool you down on a hot day, so there’s that. Beads of sweat were still forming at our noses though, so who knows really. Sums up september, I guess. We’ve got family here from france and playing ‘tourist’ has been fun. We’ve got some good hikes planned and the weather forecast seems promising so all is well. We are slowly thinking about packing up our things and our cars and heading west, with company here it will most likely all happen last minute but that’s ok. The ‘band-aid’ method works best in this case, at least for me. Keep, give, trash – there are only three options and if it’s not a ‘hell yes’ for the first one then it’s an easy choice between the next two. Meals have been an interesting assortment of pantry staples and fridge condiments – I feel so sorry for my guests. But hey, they got soup (and the sweats, oh dear). The farm stands are bursting with so much produce right now it’s almost too much. I don’t know what to choose so I just buy it all. When it comes to vegetables, it’s always a ‘hell yes!’ I came home with an entire kale plant because it was only $3. I can’t keep up with the amount of tomatoes and I bought a cantaloupe and a butternut squash in the same day. September is a one wonderful (crazy) month isn’t it? Sweet corn forever. Soup for all. Kale chips + love in abundance. I like to serve this in big bowls and bring all sorts of fixings to the table. I’m talking some cooked quinoa, marinated sweet corn, toasted pumpkin seeds, cilantro/green onions, lime wedges, maybe some feta cheese and a little chili oil. A kind of a build your own soup sort of meal. It turns a humble meal into more of a dinner party feel. I’m always looking for something to celebrate and tomatoes, corn and table full of friends is hard to beat. A celebration of summer indeed. You could use canned tomatoes here of course, but the flavour won’t be the same. If you are going to go that route than buy fire roasted tomatoes if you can find them. Otherwise just get the best quality ones available to you. If you don’t stock whole cumin/coriander seeds, feel free the sub ground spices here but use less, start with 1 teaspoon and taste as you go. Don’t try to rush the onions, this is where you will get a lot of flavour. If you taste it at the end and it’s too acidic, a little bit of cane sugar or maple syrup will help that. 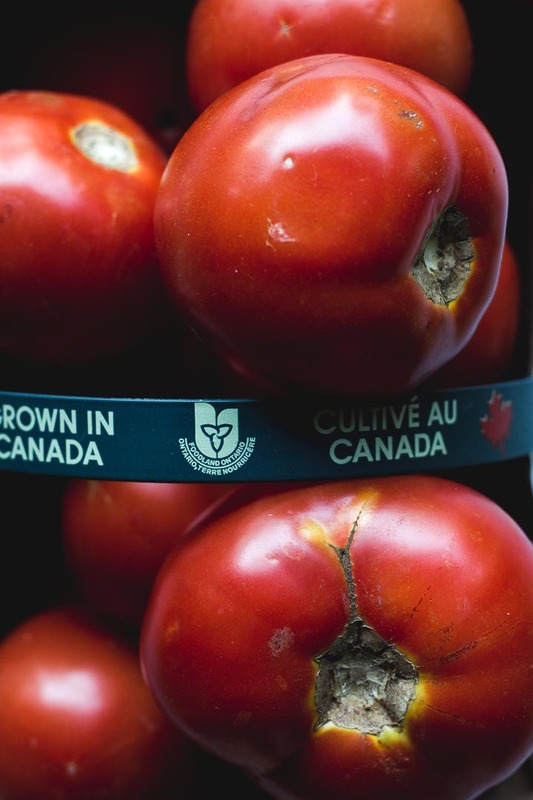 It will depend on the variety of tomato and their ripeness. The marinated corn salsa will also add more sweetness. I used water here and added salt as it cooked, but a good veggie stock will work as well. Start with a little salt and then add as you go. Salty-ness will depend on your stock, and your taste buds. Here’s another great recipe to use up any extra corn cobs you may have. Vegan and Gluten Free. Serves 6. 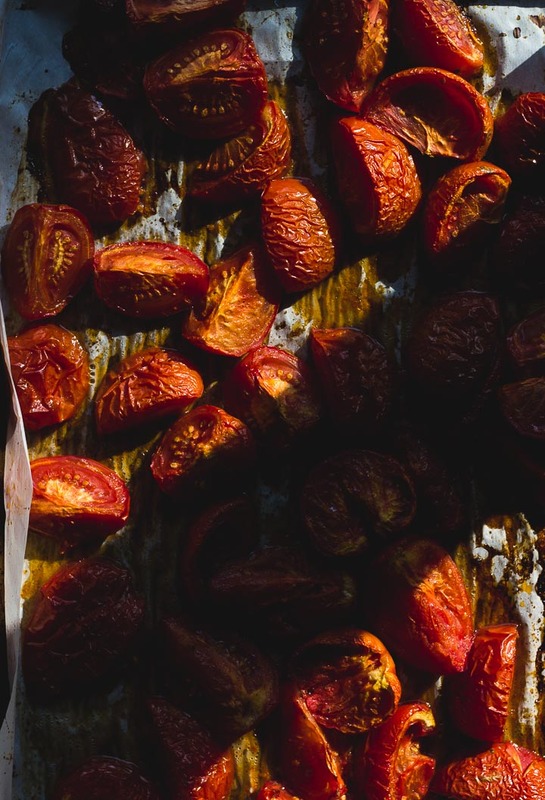 Half/quarter the tomatoes and arrange them on a rimmed baking sheet line with parchment. Drizzle with a small amount of olive oil (no more than 2 tablespoons) and season with salt and pepper. Toss to coat. Roast in the oven until soft and a little shrivelled, about 40-50 minutes. In a large soup pot toast the cumin and coriander seeds until fragrant over medium heat, about 3-4 minutes, stirring often. Remove seeds and let cool. Then blend in a spice grinder or mortar and pestle until finely ground. Skip this step if using pre-ground spices. 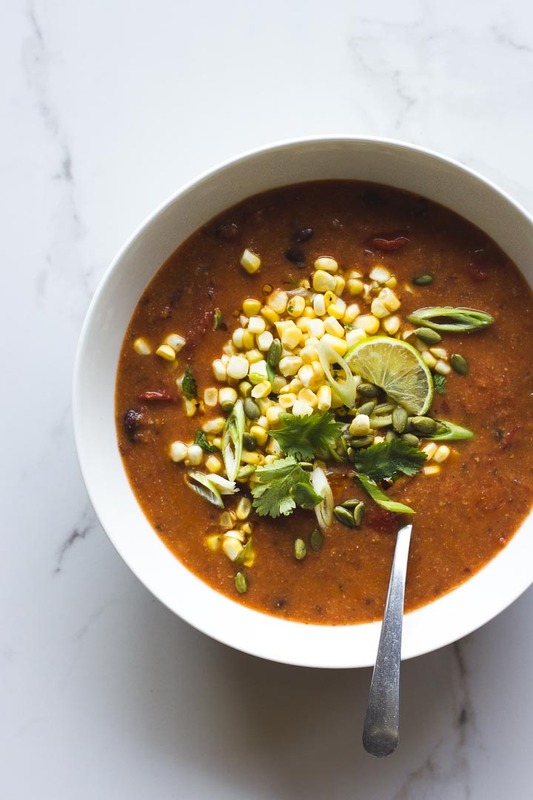 Combine corn kernels, chopped cilantro, olive oil, lime juice and green onions in a bowl. Season with salt and pepper and set aside. Heat a two tablespoons of olive oil in the pot, then add in diced onion. Cook onion until soft, 5 minutes, stirring often, then add in sea salt, cumin, coriander, chili and smoked paprika, stir to coat. Reduce heat to medium/low, cover the pot and continue cooking for 5-7 minutes. Remove the lid, add a few splashes of water if it looks too dry and continue to cook for another 5 minutes. Add in black beans and stir, then add in water/stock. Add in the empty corn cobs and bring to a boil, then reduce and simmer for 20 minutes. Scoop out the cobs and compost them. With the heat on low, whisk in the polenta. Continue whisking for 1 minute to prevent any clumps. The soup should thicken slowly. Add in the roasted tomatoes and stir to combine. Using an immersion blender, partially blend the soup but leave lots of chunky beans and tomatoes. Increase heat and bring to a boil once again, then reduce and simmer until the flavours are well combined. Season with salt and pepper. If the flavor is too acidic stir in 1 teaspoon of cane sugar, honey or maple syrup. 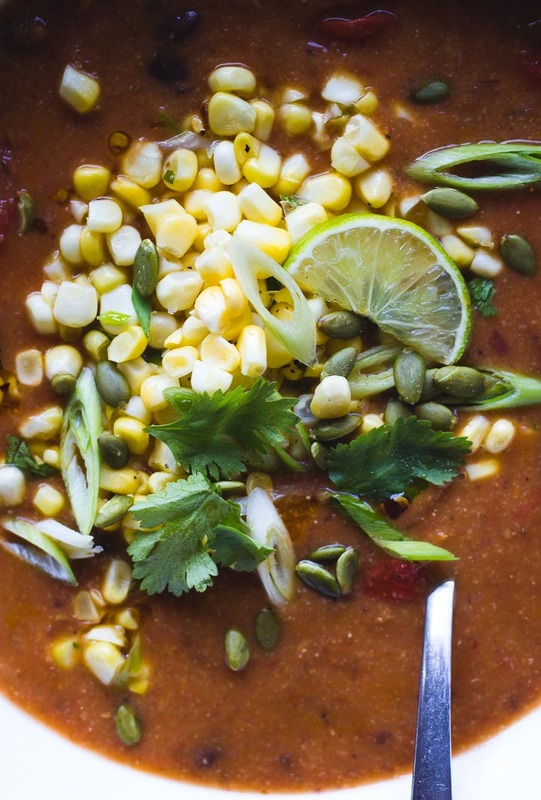 Serve soup with marinated sweet corn, toasted pumpkin seeds and extra lime. “Your poor guests” my goodness – no guest is poor in your house sweet Jodi. I’m sure you have plenty of desserts and sourdough on had to keep any human soul well fed and happy ;). This soup sounds amazing, I love all of the flavors and textures you have working in here. Good soup is such an art, and I’m really feeling inspired as I sit here with frozen fingers this morning to try to practice my soup-skills. Crazy excited for your upcoming move girl, it feels so right for you to be heading back to those mountains! Have the best time hiking and spending time with your visiting fam, and happy first day of fall too :). This looks totally amazing! YUM! I’m LOVING your blog! Mind if I add you to my veggie blogroll? Oh this sounds incredible!! 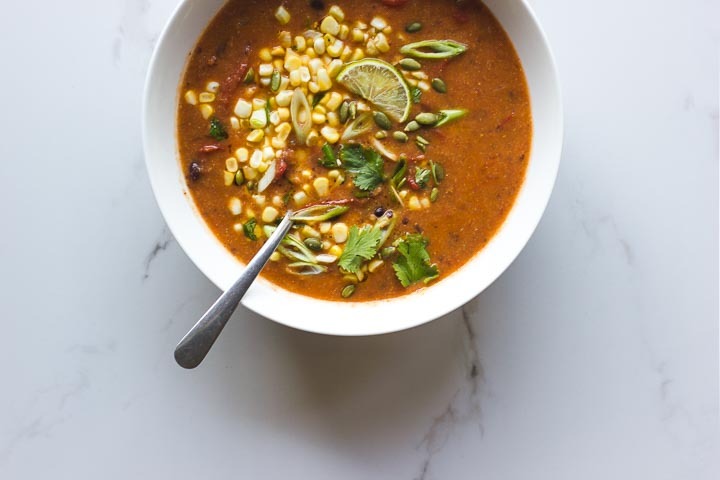 It is prime sweetcorn and tomato season here in Auckland and this soup would be absolutely perfect for one of those stormy summer afternoons when the rain rolls in and it cools off a bit (enough to make soup eating and ovens bearable, anyway!). Love all the flavours going on and the construct-your-own feel to these – I’m sure your guests ate amazingly well! I’m a soup fan and cannot wait to try this. Thank you! This was soooo good! Thanks for sharing it. 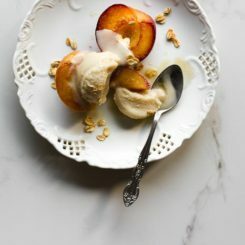 I think Ive already commented on this recipe, but I made it for an event last night and need to share my gratitude! It was such a huge hit!